G. Díaz Leines, J. Rogal. 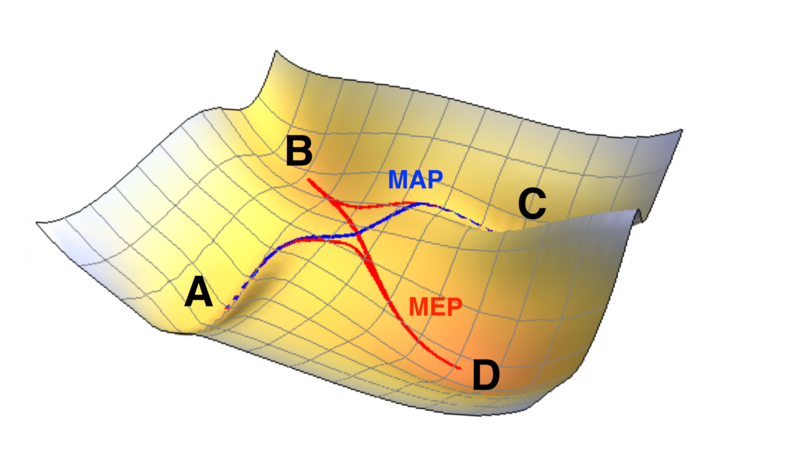 Minimum energy (MEP) and minimum action (MAP) paths on an asymmetric, four minima potential energy surface. On high-dimensional and complex potential energy surfaces, the identification of the most likely mechanism for the transition between local minima is a challenging task. Usually the steepest-descent path is used interchangeably with the minimum-energy path and is associated with the most likely path. Here we compare the meaning of the steepest-descent path in complex energy landscapes to the path integral formulation of a trajectory that minimizes the action functional for Brownian dynamics. In particular, for energy landscapes with bifurcation points and multiple minima and saddle points, there can be several steepest-descent paths associated with specific saddles that connect two predetermined states but largely differ from the path of maximum likelihood. The minimum-action path, however, additionally takes into account the scalar work along the trajectory. Minimizing the scalar work can be less ambiguous in the identification of the most likely path in different gradient systems. It can also be used to distinguish between multiple steepest-descent paths that connect reactant and product states. We illustrate that in systems with complex energy landscapes a careful assessment of the steepest-descent path is thus advisable. Here the evaluation of the action can provide valuable information on the analysis and description of the most likely path.